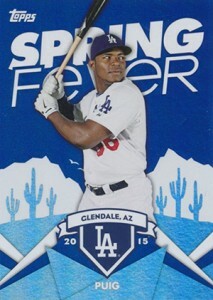 The 2015 Topps Spring Fever Baseball promotion is a tie-in to Topps Series 1. It's an exclusive promo set intended for hobby shops to give to their customers as an incentive for buying packs. For most shops, this meant giving out a coupon for a pack for every $20 spent. Those coupons could then be brought back to the shop to get a pack of five cards. 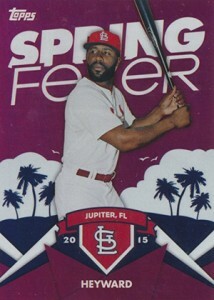 The 2015 Topps Spring Fever base set has 50 cards. All are current players. 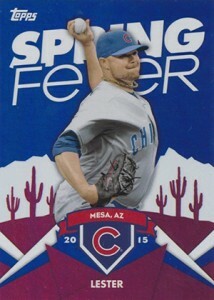 It's notable for having the first cards Jason Heyward, Jon Lester and Josh Donaldson in their new uniforms. All three were switched teams in the off-season. Max Scherzer is also in the set, but still as a member of the Tigers. He signed with the Nationals after the checklist and images were finalized. 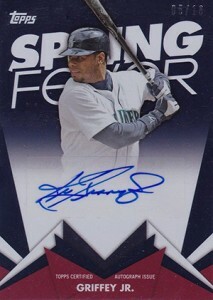 Base cards use foil card stock. The design notes where each player will be found during Spring Training. Autographs are randomly inserted in packs. These are a mix of current and retired players. Most aren't in the main set. Autographs are serial numbered but to varying amounts. The range is big with the most common having around 200 copies while short prints have less than a dozen copies. Here's a list of participating shops from Topps. 30 cards. Known print runs are noted. I’m disappointed Topps doesn’t make more of an effort to include Canadian stores in a promotion like this. With a team in Toronto, why the exclusion?